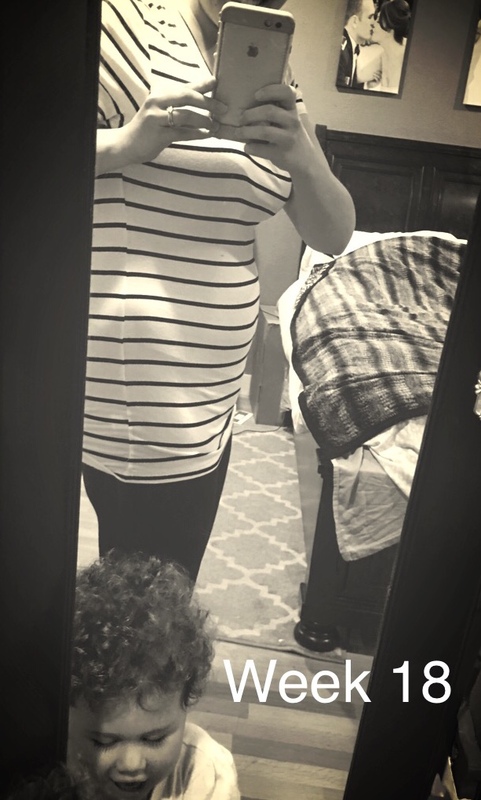 Texan Girl Talks: Week 18/19: A small GSD meltdown and a slight garlic addiction. Week 18/19: A small GSD meltdown and a slight garlic addiction. This week has been good. I've felt like my hormones have balanced out a little. AKA I've been less bitchy. Maybe. I've upped my carb game and have felt normal again. A 90lb German Shepherd + baby crib = WTF? So my dog has never done this before to my knowledge, and I have a baby cam in this room at all times that tells me notifications when there is movement. I have never seen this before. Shout out to my awesome neighbors, that we have purposefully given a key to for those just incase times that we need our dog out of our baby crib. When adding an additional baby, did your pets freak out? I'm just glad she wasn't hiding from someone potentially breaking in our house. Easter happened and so did the string of meltdowns that ensued after. This baby is slowwwwly but surely make his way out of my pelvis. Allie is slowly acknowledging there is something happening in my belly and her brother is in there. She will wave at my belly along with poking my belly button. I wonder if my belly button will poke out this pregnancy? 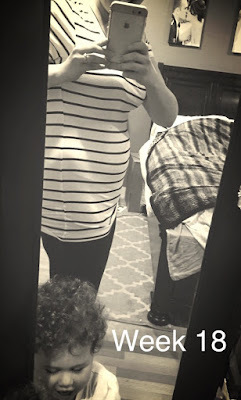 Week 19: Allie has also made her way back into the obligatory bump pics. 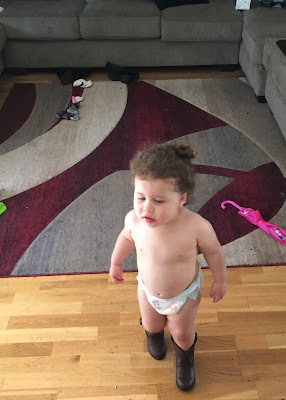 Every Texan mama has a picture of her baby in a diaper in boots. Let us hope she will keep these boots on next weekend for her Aunt Jordy's wedding! Also, up close and personal baby. #painterbaby She's coming for you Aunty Kendra! Cravings: Garlic. I made a 40 clove Roasted Garlic chicken, ate all the Garlic in two different sitting. No vampires in this house! I guess we can play, what nutrient am I deficient in? Or I'm just a weirdo? Spicy thai food has made an appearance in my life again. Glorious. My child is currently in a hitting phase, What do you do when your 22 month old hits you? -I'm at a loss because I grab her hand and say NO, that's not nice with a serious face. But I don't know developmentally where she's at. I think she understands, but still thinks it's hilarious and keeps going. I refuse to let my kid grow up thinking she runs the show. What are your thoughts on tantrums in public? Do you walk out and go straight to the car? Or do you try to handle it where you are? I was notorious for throwing frequent, horrendous tantrums from the age of 2-4 years old. Even in public, my Mom would not acknowledge what I was doing and just go about her business. This seemed to be effective. I think it's cause she knew that I fed off of the attention and had the will to prove that I was going to get my way. I never responded well when someone would "challenge" me. I was just too darn stubborn. It sounds like your baby girl is similar in that way ;) so maybe just try ignoring her ill behavior while showing favor towards her good behavior, no matter how slim those precious occurrences are ;). Studies have shown that positive reinforcement is a better way to "discipline" versus negative reinforcement. Love you girl and hope that you're doing well! I know your daughter is giving you a run for your money right now but there is hope! I was a little jerk when I was a kid and I turned out pretty good, having an amazing and dedicated Mom helps those sorts of situations. So I think Allie will eventually turn out to be an awesome individual! Week 20: WOAHHHHH WERE HALF WAY THERE!